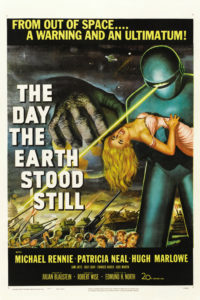 The Day the Earth Stood Still is a science fiction movie released in 1951. Filmed entirely in black and white, it is based on a 1940 short story by Harry Bates entitled Farewell to the Master. The story involves an alien visitor to earth named Klaatu, portrayed by Michael Rennie. The real star of the show is an eight-foot tall, death-ray-emitting robot named Gort who accompanies Klaatu. As one might imagine, mayhem ensues. 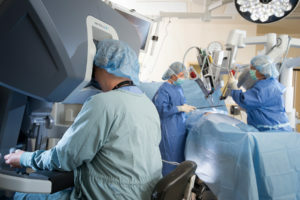 I was recently surprised to learn that it’s possible to connect that motion picture with the sophisticated systems that are rapidly developing and being used in robotically assisted surgery. As someone who grew up being told reading and viewing science fiction was a waste of time, this was of some interest to me. That connection begins with one Victor Scheinman. Mr. Scheinman, who grew up in New York City, recalls being terrified of Gort after seeing The Day the Earth Stood Still for the first time at the age of 9. He hid in his bed, unable to sleep due to nightmares in which he would imagine the robot standing in his room. His father, a psychiatrist who practiced in Manhattan and taught at Columbia, advised him to build a model of the robot as a means of dealing with his fears. In doing so, Mr. Scheinman began to develop mechanisms to animate the arms and legs of his models. This led to a variety of projects that were encouraged by his parents and teachers, and to a series of entries and prizes in various science fairs. He went on to earn admission to the Massachusetts Institute of Technology at the age of 16. 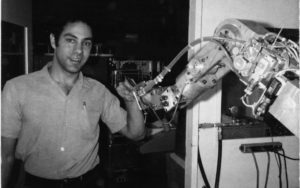 His work at MIT and then Stanford eventually led to development of “The Stanford Arm”. The technology was picked up and advanced by Joseph Engelberger and George Devol who formed Unimation in 1977, the world’s first robotics company which, with support from Scheinman and General Motors, developed the Programmable Universal Machine for Assembly (PUMA), the prototype of which now resides in the Smithsonian Institution. The PUMA was quickly introduced to the automotive industry revolutionizing the assembly line process. The 200 and 500 series PUMAs are of “desktop” size and therefore applicable to surgical applications. The first recorded applications were for assisting brain biopsies in 1985. In 2000, the daVinci surgery system became the first robotic system approved by the Food and Drug Administration. A key development that allowed for approval involved improved, high resolution and three-dimensional imaging that allows the operator to utilize the mechanical arms without laparoscopic guidance. And so, much has developed from youthful imagination, creativity and energy, suitably nurtured and allowed to develop. Recently, we’ve seen what might be the beginnings of another such example. Reports describe the very impressive accomplishments of four young people from Toronto. Beginning with an idea inspired by her grandfather’s illness, young Annabel Gravely decided to devote her eighth-grade science project to investigating causes of muscle deterioration in Amyotrophic Lateral Sclerosis (ALS). 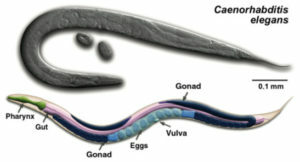 Hypothesizing a link with the muscle loss in ALS and that which is known to occur during prolonged periods in space, Gravely and her schoolmates (Alice Vlasov, Amy Freeman and Kay Wu) proposed to send a tube of microscopic worms (Caenorhabditis elegans, for those of you taking notes) into space aboard the International Space Station in order to examine the effect of zero gravity on the worms and particularly on the activity of a specific enzyme sphyingomyelinase (ASM) known to be linked to ALS. Young Ms. Gravely (now 16 years old) and her colleagues have their first publication citation. And so, we have two accounts of youthful inspiration, one arising in response to an imaginary threat, the other from the memory of a beloved grandparent. Both bring much credit to the young people involved and remind us that age need be no barrier to creative thinking and dedication to a goal. However, the significance of these success stories goes far beyond the young originators themselves. Potentially groundbreaking ideas, like seeds cast into the air, must find fertile ground if they’re to flourish. Scheinman and Gravely were able to find such fertile ground in the support and encouragement of their families, schools and communities without which their brilliant insights might have never come to fruition. Transformative innovation can be thought of as applied inspiration. The originating idea is necessary, but insufficient if not supported. In the world of medical education, we encounter many potential Scheinmans and Gravelys, who experience their own moments of inspiration. Given the “busyness” and apparent urgency of our educational and clinical lives, it’s easy for them, and for us, to let those opportunities pass in favour of achieving more immediate short-term goals. From time to time, it serves to be reminded that great achievements can start from rather humble origins – such as scary science fiction movies and microscopic worms.